Our underlying goal in a SHTF scenario is ultimately to stay alive and live without exposure to risks. As much preparation as many of us have made, in the altered world of a SHTF crisis, there will be many dangers that lurk; and some of them will be inadvertently from our own doing. [Editor’s Note: Our underlying goal in a SHTF scenario is ultimately to stay alive and live without exposure to risks. As much preparation as many of us have made, in the altered world of a SHTF crisis, there will be many dangers that lurk; and some of them will be inadvertently from our own doing. ReadyNutrition Guys and Gals, we just finished a series on how to escape from Bill Ayers’ Summer Reeducation Camp (or Gulag 17, depending on the situation). Now we will cover one of the most important elements of all: How to stay out of the “Happy” Camp. Best thing of all: do not go in. Easier said than done, however, there are some things you can do beforehand that will increase your chances of staying out of the Gulag. You must do things that others do not do, and you must not do what others do. You’re in bed…it’s a Saturday morning, and you don’t have to go to any of your 3 jobs today until noon. Your battery-powered clock seems to have stopped at 5:15 am. Puzzled you hear the drone of jet engines, and all of a sudden the house seems as if it is shaking. You jump up and run to the front door and as you walk onto the front porch, all hell is breaking loose. Your mind is playing, “For Whom the Bell Tolls” by Metallica as you look up and see dozens of aircraft flying West to East, disgorging sesame seeds that sprout parachutes by the thousands, all coming down into your neighborhood. “Red Dawn” isn’t playing: it is happening, and you’re in it. Your neighbors didn’t bother to come wake you up; however, they’re working on starting their cars, with no success. The paratroopers are landing, and a large crowd of people is running down Main Street to the tune of automatic gunfire in the distance. Yep, you guessed it! America has been invaded, and chances are you are not going to be handing out a Slurpee this afternoon. Now what? You must fall upon the six laws of survival or else all could be lost. In a survival scenario all bets are off and the following laws will keep you alive. These laws are rigid, but necessary. Harsh, but true. Keep your cards close and always have a plan. Law 1: Wherever that crowd is running, do not join them. This is not to say that they aren’t (initially) running in the right direction. But what of it? They are bound to be either captured en masse or worse (bombed, strafed, or shot). For the horror of the IHM (the Incredible Human Mob), look no further than “War of the Worlds” with Tom Cruise where he and his family are driving the passenger van…right up and into the mob. Look what happened there. You can’t defeat their numbers, and you will be captive to them…another steer in the herd. Strike out on your own, you and your family, avoiding the main thoroughfares at all cost, and avoiding the IHM. Law 2: You have to have a place (and places) to go. This is where thinking outside of the general herd will pay off. We’re going to instruct by running through a checklist…. this will be a “handy-dandy” checklist that you can print out or run over in your mind to be able to follow rule #2. Did you preposition assets (food, weapons, money, etc.) at an initial safe location? Is that location within walking distance for you and your family? Once there, are you and your family secure for at least a 24 – 48-hour period? Safe from enemy troops/government “peacekeepers” on the hunt? Safe from fallout and/or NBC agents? Does it have a food and water supply to sustain all of you for 7 days? If your initial safe location has been compromised, is a duplicate location nearby? Do you have a farther (more remote) location that you can reach on foot in 3 days? A secure, sustainable location with supplies for at least a month? Do you and your family have a handheld method of communication for each member? Have you formulated short-term (initial contact, 48 hours, 7 days) plans? Have you made long-term (1 month and month-by-month; 6 months and 6-month continuous analysis; 1 year) plans? Law 3: You will be leaving your home, permanently or for a long time. This is survival. The majority of readers are not living in the mountains or in a remote location. If you follow these steps and practice them on a dry-run on a regular basis…it will give you the advantage that most people will not have. You must innovate: come up with ideas that others will not think of. Do you know of an abandoned warehouse on the outskirts of town? Chances are that 90% of others will think the same thing in a grid-down/Red Dawn survival scenario. You need to find the places that are off the beaten path. And if there are none? It may mean that you have to create a place. Law 4: In survival, there is no silver medal: “second place” means death. Forget that phrase in “The Hunger Games,” because if you are taken…the odds are not ever in your favor. We went through a 4-article series on how to escape from the Gulag where I reiterated how important it is for you to stay out of it. I stand by this concept. If you are taken captive, the odds aren’t in your favor of getting out…for the duration of it. And then guess what? The Germans during WWII as the allies approached began to hide their transgressions by liquidating the camps…basically killing everyone that could bear any type of witness to the atrocities. Do not think for an instant that it will not happen again. Look at Holodomor in Ukraine and the starvation tactics the USSR used to follow after the Malthusian model. Our enemies have very little regard for human life, and the lives they value are of their own people. If the Chinese communists would run over their own people with tanks and sell their internal organs while they’re still alive, what will they do with us? Law 5: You must stay out and survive by any and all means necessary. Some of you may think “JJ is a little harsh.” I would rather be hard and harsh now, and enable you, my countrymen, to have some tools at your disposal and a “sharp tack” under the figurative buttocks of your mind to give you the impetus to do something about the situation prior to its occurrence. The country is “long in the tooth,” and you have to grasp these concepts and act upon them now…not burn off the pages and save them in the survival archives…but use them to inculcate your own, individual plan of action now. 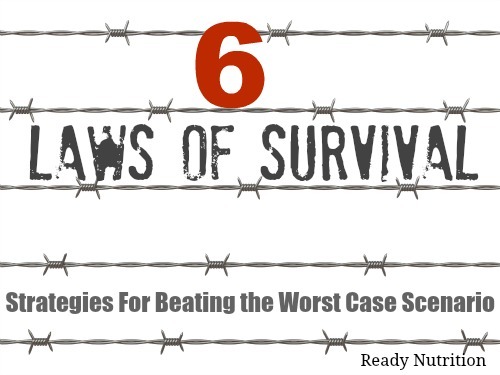 Rule #5 means resolving yourself to do what you must in order to protect yourself from the ravages (and not just possible, but probable death) inside of one of these camps. These are all basic, “generic” things to begin as a base for your preparations. This is a form of guerilla warfare! Avoid the occupiers/oppressors at all cost! These things will work for you…if you resolve yourself (ves) to do them. I’ll close with a note on OPSEC (operational security): you better build off of these basics and keep all of them to yourself. Law 6: Do not tip your hand or reveal your plans to anyone. Next installment we will talk about life under occupation, be that by foreign invaders or by totalitarian state that has morphed out of a democracy. In the meantime, prepare and plan, and when you are reasonably sure, execute a dry run. The practice does make perfect and affords you a time and trials to iron out all of the glitches in your operations. Until next time be good to one another and keep up the fight! And the living shall envy the dead. Basically there is only one-rule in a no-win situation. Don’t give up, keep going and doing. Can you say ” Kobayshi Maru? Is that like, “Just keep swimming”? I have supplies in one place: home. The author is pretty much in fantasy land when he admonishes me to have some other place (in 3 days walking distance, no less). He might as well have said, “You MUST have a personal rocket ship if you wish to survive.” Can’t afford it, sorry. I agree. I’ve read survival books that say when you go “on the run” you become so much more vulnerable. They say you should not flee anywhere unless you absolutely HAVE TO. Hunker down with all your resources in-house. That depends on where you are hunkering down and the circumstances. There is no set plan. I live in an apartment in NYC. With no electricity and running water, it would be very difficult to “hunker down”. I have food and water and could stay for a short while, but would have to be Oscar Mike in relatively short order. I do have a supplies off-site, provided I could get to them. I watch the news and am vigilant, but no plan guarantees success. I can think of a number of scenarios where even those in what most people would perceive as an ideal “retreat” would have to boogie. All you can do is prepare for the possibilities that you face. Whether you’re indoors or out, in a cave and whether it has outlets you can get through, if you’re in a forest and what kind with marshy ground or dusty with rocks, and on and on… ALL OF IT makes a difference in strategy AND tactics. Choosing the right ones make the difference between survival and failure – or maybe even living well. For a time, at least. If they use the Jade Helm house-to-house scenario though, then a house is a trap in most cases. Maybe after they’re gone and you can get back you can use the house. Otherwise I’d choose the out-of-doors, especially when I know the area and soldiers not from there DON’T. I know the Law of the land, and NO ONE has the right to do what the fake “government” in D.C. intends to use foreign soldiers – and no doubt a relative few of our own (or so I sincerely hope) – to do. I’ve read and studied everything I could find, and I’ve come to the decision that no matter WHAT, I won’t be going to a FEMA Concentration Camp. I’m just one disabled old vet, and I’ve been held in a position in which I very nearly starved to death before. I’ve tried hard to live a good life, and haven’t done badly, at least as far as who I am, how I treat others and so on. Now suddenly I’m told everything I honor and revere is Treason. Well, I also learned a long time ago to recognize Evil when I see it. I don’t lie, or steal or cheat, I help people (two-legged or four) who need help when I can, and a recommendation I’m kinda proud of is that I’ve been adopted by three cats! My country has been betrayed from the inside out and from the highest levels down. I know who did it and why, and when the time comes, I’ll do whatever I can about it. I’ve known for some time that I’m unlikely to survive this. If I’m gifted with the chance to make sure my wife and family DO survive it in good order, I can’t ask for more! Meanwhile I’ll prepare as well as I’m able, and I’ll do what I can to stomp on the arches and spit in eyes of those did and are doing this! It was a magnificent country and a miraculous world that my grandchildren will never see, nor are THEIR grandchildren likely to. Even if we win it will take many generations for this world to heal. Someone DID THIS, and I and others like me owe a debt. It’s about time to present the bill one way or another. Ian, that is the best comment I have ever seen on this subject! We live in a day when, as the Bible says “They call evil good, and good evil”. They’re seeking to destroy the best people, and the society which was built by such people years ago, which had enabled the most people to lead the longest most prosperous lives ever, so that they can instead create a world dependent subhuman slaves. But the reality is, that those people, and the mercenaries who do the bidding of the overlords without conscience, are a liability and not an asset- and such will not even survive long enough to create their slave-world, let alone be able to maintain such a world. Kinda makes me wonder if the real goal is to instead eliminate those people, and then biuld their evil new world on the cream of the crop who survive? If so, that’s not going to work out too good for them either, because most of us would rather die than be a part of that world, that as we have already voluntarily largely withdrawn from this present loony world of theirs. From one old disabled vet to another, I agree completely. We will stand our ground at home, and go down fighting. We aren’t running anywhere, which would be like chasing a flock of rabbits. Glad we never raised a family, America is without hope. Depends where you live. In the cities/suburbs, that would most likely be a losing proposition. Guess that’s why I now live in a very rural area- where everyone can and will defend their home and property. Cities and suburbs are barely sustainable now…imagine then! Picture some guy trying to defend his condo with a sock full of pennies, ’cause he can’t even have a real weapon, like the criminals do. Definitely agree with you though about why anyone would raise a family in this mess. I made the decision not to when I was 16 (1978) when things were a lot better than they are today. Even then, it was easy to conclude that we are not free, and I had no intentions of bringing children into a world where they could not be free, but where they’d be tax slaves all of their lives, and nothing but sponges for propaganda. Ain’t using my juices to replenish their labor pool! ………”Hope” is the only thing that never escaped Pandora’s Box. She never makes an exit. A place to go….within walking distance?! LOL- and such a place will somehow not be affected by the same conditions affecting your home a few miles away7? Stay out and survive by any means? No….there comes a point where surviving ceases to be profitable, and turns one into a brutal animal who is no better than those from whom he is running. Avoid capture; Do good; survive if you can, and most all, live free and in good conscience. Under some circumstances, dying may not be such a bad alternative. I’ve noticed, both in life in general, and in catastrophic situations, people ho do nothing, and people who will do everything to preserve their lives, are the two classes who usually fare the worst. Those in between- who make reasonable efforts to do what they can, but yet who do not go to extremes, often fare the best. The “Don’t Tip Your Hand” suggestion is one of the better ones on this subject. -And that should include not posting your actions or intents on Facebook or the like! Social media, unless it’s a business, websites or news feed, is a time waster, and/or for those that lack a real life, as in relating back forty, fifty years ago writing x classmates or brain dead relatives you haven’t seen in decades. Gov. is using social media to profile patriots, etc. get real folks, and get off the media unless you are in biz, news , or websites. Get with local folks you can trust for bartering and protection, and ditch loser friends who aren’t on board/tuned in, by avoiding them, not returning calls, etc. this incl siblings or former social cliques, etc. Ditch 501c3 gov. controlled fake churches now, they have been hijacked by change agents for decades, run by hireling clergy apostates. Home church with family and close friends and stay low key. Yes! It amazes me how many people not only have nothing better to do than to post their own private matters and play games and converse with people with whom they never cared enough about to even give them a phone call in the last 20 years…but how they also don’t care about their privacy, and how these sites invade their computers and other devices, and track virtually everything they do- and all for what? So they can let the world know that they are sad because the Kwiki Mart was out of Doritos when they stopped there at midnight? Just a sign of how worthless our post-Christian culture has become. You speak the word my friend. Godspeed to you and yours. And if we ever have the needs to be “out and about” I hope to run across like minded spirits like you. During WWII, when 50 million Europeans were slaughtering each other, people were dining in nice restaurants and going to an evening at the opera in Argentina. Don’t live in a country that will be involved in a nuclear exchange. Amen! People seem to want to stay in a dysfunctional country until thye last possible moment- but in reality, if they aren’t motivated enough to leave when they see corruption at all levels of government becoming rampant, and society itself becoming utterly degenerate, then it will be too late by the time they do think it’s time to leave, as they will wait for all hell to break loose, and the total abandonment of what is left of law and order and Constitutional protections. And seriously, why would they want to stay, and not rather extricate themselves from a degenerate society/nation at the EARLIEST opportunity, rather than living amongst the crud until the last possible moment? And also, it’s much easier to extricate one’s self in degrees, before things turn cataclysmic, than to just try and up and leave overnight. I extricated myself from the NYC metro area 14 years ago, to a remote rural area, where I can enjoy a great quality of life NOW, and learn how to survive and make the necessary preparations. Next step will be out of the country. People who think they can just pack up some survival crap n their SUV and go camping for a few weeks on some lot they bou8ght, are in for a rude awakening- even if they can manage to get there when TSHTF, and even if their spot is in a safe place…..both of which will be very unlikely. I know, Ian. I’m still here because I’m not going to just walk away from my 91 year-old mother and my animals….. But you know, if we don’t get out while we have the chance, one day we are going to be kicking ourselves and saying “Why didn’t we just go when we still could have? It might not have been easy, but it would have been easier than trying to survive in this; and ________ and ______________ would still be alive….”. I mean really, how many people have successfully been able to survive in the countryside for years during a war? And the very, very few who have, were virtually always alone. Our choices for the immediate future may be hard…but not as hard as if we do nothing…..
You can get established in some nice out-of-the-way third-world countries for what would barely be a month’s living expenses here in the US. I encountered the same arguments when I was trying to get out of the city. People paying $2400 a month rent or $12K a year in property taxes complaining that they couldn’t possibly afford to leave one of the most expensive places in the world and buy a few acres and an old mobile home for less than the cost of a year’s rent, where they can live virtually for free for the foreseeable future. Coming from a place where land was worth over $100K an acre (kif you could afford to pay the taxes on it!) people just seemed ignorant of the fact that there were still places here in the US where land could still be had for c $1K an acre- and a lot less than that in Bumphuct Egypt….. I concur with those inclined to stay at home and fight, perhaps defending their neighborhoods. Carrying enough food, weapons, and water, to get a day, much less three, from your home is not going to be easy or even do-able for most. On the road (or in the brush), you are at the mercy of many unforeseen influences from aggressive like-minded people, to bandits and cutthroats enjoying the new paradigm WROL, to dogs (yes, they will become a huge problem), to official combatants. Many think all they have to do is find some woods and “live off the land”. Problem is, we have out-bred the resources of this country and failed to practice reproductive responsibility. As such, there will likely be hundreds or thousands with their sights set on the same patch of woods as you. People who had the means to have a nice place in the country will not welcome the herds that come to strip and destroy their resources which they rightfully consider to be theirs. I am not fortunate enough to have such a place in the country but I have pondered if I did, how I would be able to most humanely help people fleeing a bad situation, post EMP or otherwise. Pondering the pros and cons of such benevolent actions, sadly, I came to the conclusion that doing such would not be in the best interest of myself or my family. Think about it. In a post SHTF world, you would likely see a minimum of hundreds of refugees at your remote outpost within weeks, if not days of an event. You cannot possibly feed all who would show up and still feed your family and yourself in the near future. What if you have a pond (s) on your property from which to fish or obtain water? As a whole, people are inconsiderate, irresponsible, disrespectful jerks. I can see a significant number who were told they could have water from your pond (where you and your family get their cooking, bathing, and drinking water from) bathing in it, urinating and defecating in it, spitting in it, and even doing laundry in your pond. At some point, diseases will occur and begin to spread. So, you put up signs to keep walking that you have nothing to share and do not wish to hear the sad stories. Everybody will have several. A few, or maybe a lot, of brazen souls will be certain to disregard the signs and tread to your door to plead their cases. Again, your family and yourself should be Job #1. So your humanity kicks in and you make an exception or two, telling them this is a one time thing and imploring them to NOT tell anyone else that you set them up. They leave and upon meeting other famished souls begging for help, they have nothing to give or offer them, ….. except information. Against your requests, they tell of this nice family back up the road who fed them and let you fill your water bottles from their pond. Yeah, the property with the “Keep On Walking” signs in front, that’s the one. Word spreads and seeing a potential soft heart, soon you have a mob in your yard. Distasteful as it is, you need to decide whether you will allow the mob to trash your property and deplete your stores of food, or start shooting. To cut down on corpses needing disposal, you probably shoot arms or legs, hoping the ones hit will flee your property to die of infection elsewhere. Hopefully, this word will also travel and there will be no repeats. In a post SHTF world, this will happen. Like endless winos hitting you up for “a dollar” or spare change as you walk along a city sidewalk, there will be endless people with their hands out and endless sad stories. Like the winos, you won’t be able to acommodate all of them, not unless you wish to soon join their ranks. Knowing how quickly this will play out and how soon those along “the road” who have not been robbed and murdered by violent criminals will tire of the begging and the disrespect of their land, I will likely choose to hunker down and shelter in place. This is mostly not possible for most people. I don’t have multiple bug-out locations, and can’t afford to stock multiple locations anyway. This is ridiculous unless you are making a couple hundred thousand a year; a 1-2%er. So, If the Russians parachute in, are they really going to indiscriminately shoot everyone they see? I doubt it. At this point, I’d probably welcome them, as they are probably less likely to harm me than DHS, or any other 3-letter agency now armed with military grade weapons. America the once-great has fallen, fallen, and has become a habitation of every unclean and hateful bird, for she says in her heart, I sit a queen, and am no widow, and will see no sorrow, and in her was found the blood of all who were slain in the earth. Jesus Christ is LORD, and there is no other, and if this nation doesn’t repent, it will surely burn. If it burns un-repentant, then I will both rejoice and mourn: rejoice for the destruction of what has become the most horrifyingly sinful empire in the history of the world, and mourn for the loss of people who preferred to worship America instead of their LORD and Creator. Looking forward to having every tear wiped away. Nuts. Home best place with like minded neighbors. Only a fool would advise people to walk somewhere – you can’t carry enough long term supplies and possessions. Exposed and vulnerable – nuts. Bad advise. Better to project and perceive positive rebalancing rather than emphasis more evil. What of old people? Some loved ones are old and crippled. The handicapped? God help us! They will die I guess. Without someone to feed them or give them their medication they will die anyway I guess if they take them to a camp somewhere. God I hope I am no longer here when this happens. “Take two salt tablets and drive on”! The Germans did no such thing. Starvation and disease killed most of those who died in those work camps. Further, Holodomor was caused by the jewish Bolsheviks who the Germans were fighting, the same group of cretans who control our government now. Soros immediately comes to mind, as does Albright, and Chertoff. Need I go on? Just a short aside on a bit of history that seems to be forgotten. The concept for concentration camps were “invented” not by the Germans, but by the Brittish during the Anglo-Boer war 1899-1902. Growing up with oral history of great grandparents that survived the concentration camps and the scorched earth policy, one should keep in mind that even remote areas can be located easily today. I feel strongly that one should have a plan B and C if you can afford it.